Yet another 240Hz gaming monitor is about to hit the shops soon, this time it’s a model manufactured by ViewSonic. The ViewSonic XG2560 comes with Nvidia G-SYNC support, striking 240Hz refresh rate, and a rapid 1ms response time speed for the most responsive and intense gaming experience when it comes to fast-paced competitive gameplay. 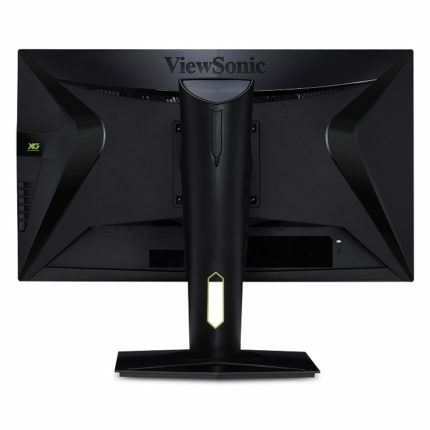 Complementing the impeccable performance, the monitor also offers full ergonomic support and extensive connectivity as well as the exclusive ViewSonic game-enhancing features we’re used to. The ViewSonic XG2560 240Hz gaming monitor is based on AU Optronics’ TN panel with 400-nit peak brightness, 8-bit color gamut achieved by dithering (6-bit + FRC), Full HD resolution, common 170/160-degree viewing angles, and 1ms response time speed. Overall, don’t expect the picture to be any better than that of an average TN-panel monitor due to the mediocre color reproduction. Furthermore, the narrow viewing angles will cause the picture to shift in contrast and color when the screen is viewed from skewed angles. Alas, if you want the best performance in FPS games, you will need to make peace with these disadvantages and focus on the bright side – which is the imperceptible 1ms response time speed that makes for zero motion blur or ghosting of the fast-moving objects. Although the Full HD resolution with 1920×1080 pixels is not by any means modern, it is sufficient to make the image crisp due to the small 24.5-inch monitor size and consequently, decent pixel density. Additionally, 1080p will make it easier on your GPU to maintain higher frame rates which is what the ViewSonic XG2560 is all about. 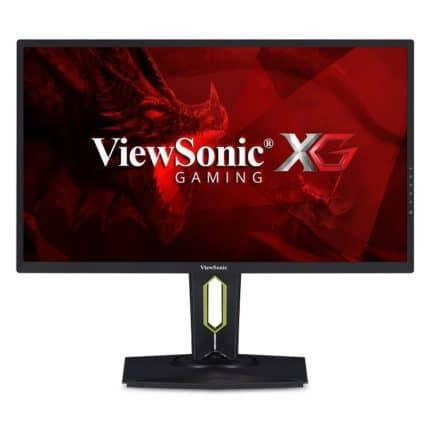 The ViewSonic XG2560 24.5-inch monitor features the Nvidia G-Sync technology which allows you to synchronize the display’s refresh rate to a compatible Nvidia GeForce GPU. By doing so, you eliminate screen tearing and stuttering without increasing the input lag as long as you’re within the dynamic refresh rate range (30Hz-240Hz). Another feature that comes bundled with G-SYNC, is ULMB (Ultra Low Motion Blur) which can further eliminate the perceived motion blur. However, ULMB cannot be active at the same time as G-SYNC, and it only works at 144Hz max. Other gaming features include Low Input Lag mode which bypasses certain image processing in order to reduce input lag and Black Stabilization for better visibility in dark and shadowy areas of video games. There’s no shortage of attributes when it comes to the design and connectivity of the ViewSonic XG2560. The monitor offers full ergonomic support including tilt, pivot, swivel, height adjustment, and VESA mount compatibility. You can find two USB 3.0 ports on the side of the monitor and two at the back while display connectors include an HDMI, a DisplayPort (for 240Hz and G-SYNC), and an audio line-out and line-in for the integrated speakers. The thin bezels make for a cinematic viewing experience and great multi-monitor setups while the matte anti-glare coating eliminates all distractions. 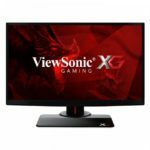 The ViewSonic XG2560 MSRP price amounts to $573 while the released date is set for February 2018. 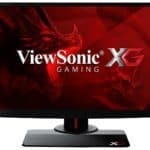 The price will likely have to drop if ViewSonic wishes for its model to stay relevant as the more premium 240Hz gaming monitors such as the Acer XB252Q and the ASUS PG258Q cost less. 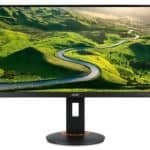 The same monitor is available with the AMD FreeSync technology instead of G-SYNC (and for that matter, red color accents on the design instead of the green) and it’s also more affordable, so be sure to check out the ViewSonic XG2530 which is also the cheapest 240Hz gaming monitor currently available.